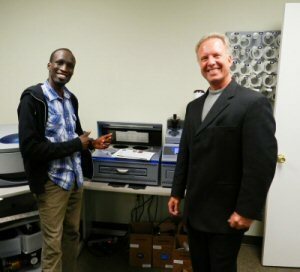 Optical Dynamics was pleased to host Boston Marathon winner Wesley Korir at our offices in Louisville, for a demonstration of the Q-2100 Digital Lens System. Wesley, a permanent resident of the United States, works with charitable organizations in his native Kenya to improve the lives of the improvised. Having grown up in a poor family himself, Wesley has a passion for assisting the needy and helped to create the Kenyan Kids Foundation to further his goals. The Kenyan Kids Foundation began by financing high school education for underprivileged children through full and partial scholarships. Their goal as a foundation is to continue to support these students throughout their high school education. In addition, they have partnered with the Hall Steps Foundation raise funds for a hospital in Wesley’s village. Wesley visited with Optical Dynamics to discuss how the Q-2100 can bring improved vision to remote locations in Kenya. We look forward to working with Wesley and his foundation in 2013.